“Super Computer Sheds Weight, gains mobility, Becomes "Server-on-the-Go"
Intel has published a case study on the EUROCOM Panther 5SE Mobile Server as part of winning the “Form Factor Solution Innovation Award”, titled “Super Computer Sheds Weight, gains mobility, Becomes "Server-on-the-Go". 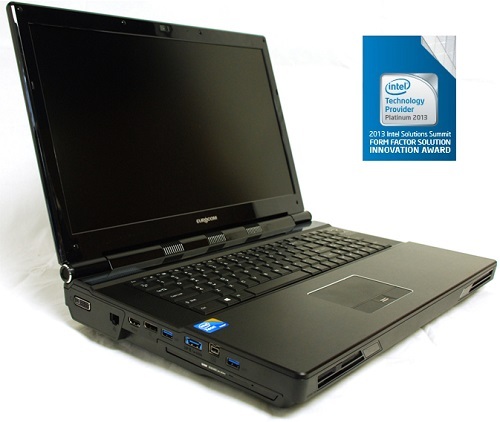 As an Intel Platinum Reseller, Eurocom works very closely with Intel to offer innovative and cutting edge technology to professionals who demand powerful computing solutions wherever they may be. At the 2013 Intel Solution Summit, Eurocom was awarded the Form Factor Solution Innovation Award for delivering the most innovative mobile solution based on Intel Technology to meet our customers’ demands for mobility. Supporting multiple server class operating systems such as RedHat Enterprise Server Edition 6.4, Microsoft Server 2012 & 2008R2 and VMware ESXi, while supporting up to 32GB of DDR3 1600MHz RAM via four 8GB SODIMM 204 pin modules, Intel® Xeon® processor E5 series and up to four Intel® S3700 solid state drives in RAID 0/1/5/10 gives the EUROCOM Panther 5SE the performance capabilities of a datacenter server in a portable form factor, complete with workstation tools such as keyboard and monitor. If you would like to write a story about or review the Panther 5SE in your publication please let me know.